Since Ariel Andrews first learned to write, she has been singing, writing lyrics, composing music and establishing herself as an artist. Using guitar and piano, Ariel has created memorable melodies. Her observations of life and love are captured in her catchy, to-the-point lyrics that produce an "I can't get that song out of my head" response. Influenced by artists such as Elton John, Carly Simon and Joni Mitchell, Ariel has developed her own unique style as a singer-songwriter. She has performed in musicals, talent shows, and plays, as well as her own variety hour. With her varied interests and musical talent, Ariel is a recognizable and positive image for her peers and aspiring artists. Ariel is a graduate of Wittenberg University (B.A. Communication) and received her M.A. in Entertainment Industry Management from Carnegie Mellon University. While completing her Masters degree, Ariel worked with Daniel Glass at Glassnote Records, assisting the West Coast Head of Operations in the A&R and Licensing departments. She worked with Mumford & Sons, Phoenix, Robert DeLong, Childish Gambino, Chvrches and more. Ariel learned the ins and outs of the independent label world from start to finish, from finding and signing an act to making that talent known to the world. After obtaining her Masters degree, Ariel went on to explore the major label world at Epic Records and worked in the Pop/Rock A&R department. While there, she worked for Fifth Harmony, receiving A&R Coordinator credit for its first EP release. She also worked with Avril Lavigne, Karmin, and other hot artists sourcing demos, booking studio sessions, and in single/album launches. After one year at Epic Records, Ariel returned to her songwriting passion and began representing writers and producers at Warner/Chappell Music Publishing. In the Pop/Rock A&R Department, Ariel ran the day-to-day for songwriters such as Justin Tranter, Asia Whiteacre, Eric Rosse, and artists such as 21 Pilots, Katy Perry, Kimba and more. After two years working in publishing and almost 5 years working in the Los Angeles music scene, Ariel moved to New York City and is currently working as a Senior Project Manager at one of the top 10 global advertising agencies. She is working on her next series of original songs. Get your ears ready for her next release! 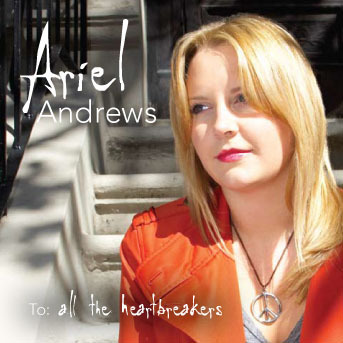 Check out Ariel's second CD "To: all the heartbreakers," on sale at iTunes !